Budget preparation is an essential action step that if you pretend you don’t need you’ll never get past GO with your finances! Creating a personal budget doesn’t have to be complicated however the fine details certainly help to assess where existing or potential problems may sneak up. 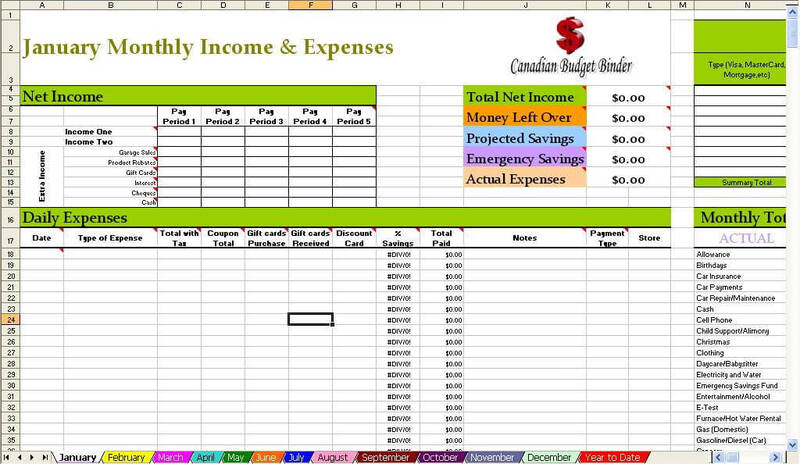 Using a financial spreadsheet to document everything to do with money coming in and going out of your life is in my opinion an essential tool for everyone, even if you think you don’t need it. You do! Every month before you sit down to figure out your finances there are budget preparation steps that you don’t want to miss. The reason for this is because if you put half the effort into your monthly budget you’ll only get partial or potentially inaccurate results. Like you, budgeting was new for us years ago and took time for us to get to familiar with but over time we can safely say we are in a place where we confidently collect the monthly data we need. If you are one of those people who think you can search the web for a free budget template and think that’s all it takes to get your finances on track, your walking into your debt with blinders on. Take off those rose coloured glasses and have a serious look at what’s happening in your financial house. Budget preparation is one of the main reasons people fail at budgeting because they see it as “extra work” and people don’t want that. Let’s get real for a second. Nothing in life comes without a bit of elbow grease so find the time to get the dirty work done right. Think of budget preparation as the blueprints for your house. A budget is NOT turn-key which means you need to work at it. I’m tired of reading about how simple it is to budget and all you need to do is throw some numbers together. Huge mistake. If you try to build your house without a visual plan in place you’d struggle. You may get the house built and looking pretty but the walls are not secure. Your house can tumble at any time because you didn’t use the right tools to get the job done. Budget preparation means working from the outside in so you cover all of your bases. 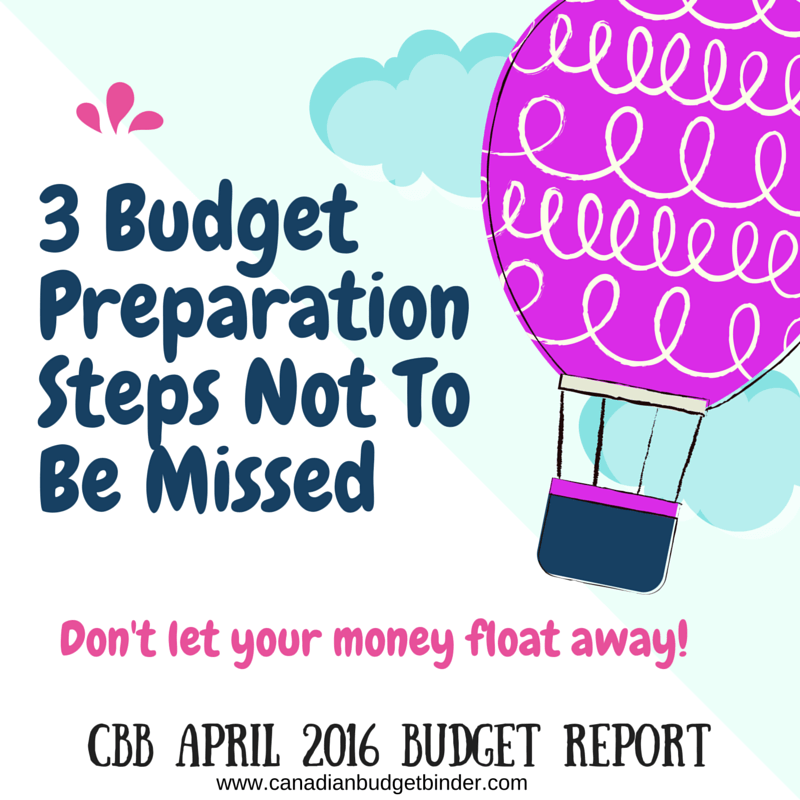 Write these Budget Preparation Steps Down Now! Before computers were a big thing many of us crazy people used something called a pen and paper. It was easier to write stuff down because it was burnt in my head as opposed to just reading how something was supposed to be done. I like math for example, but I don’t LOVE it. I can’t just look at a complicated math question and figure it all out in my head. If I could I’d likely be doing something far different in life than what I’m doing now. My point is when you use examples and practice, things get easier. So often we rely on computers to get the job done and it’s taking away from the hands-on approach. Computers are hands-on as well but I don’t find it to be the same as “doing”. If you’re just starting out with budgeting these 3 budget preparation steps will help lessen the stress that comes with budgeting and help you employ the easiest route to being successful with your budget. Where is all your money going? If you don’t know where every penny you earn is going then you need to start tracking it now. Don’t wait until next month, next year-start now! It’s critical to know your numbers which means document everything even if you have to write it all out. I find this easier but it’s up to you. Make sure you know how much money you gross (earn), net (take home), debts and other monthly bills that need to be paid. You want to know how much interest you are paying and what the total amount you owe is. 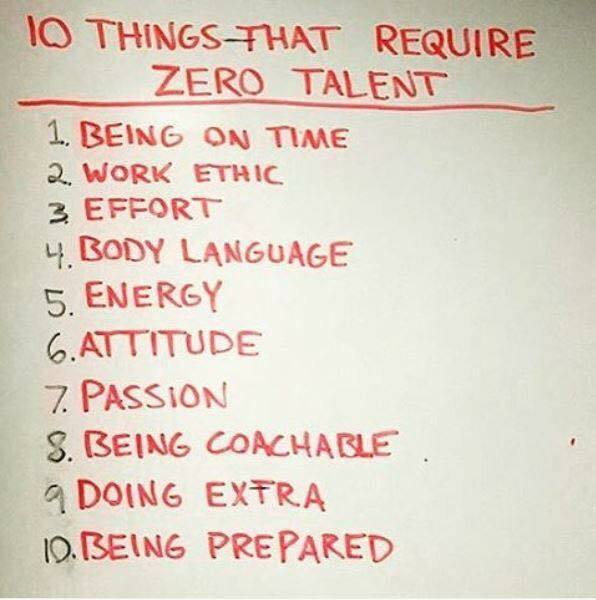 All these little details are critical because if you don’t know them they will get to know you and fast. Don’t let your money take over your life. You will want somewhere to keep all of your documented information and the receipts that you will be collecting when you spend money. I’m not laughing because we’re debt free and you know what, we still do it. I am proud to say that I am not shy or embarrassed to ask or collect receipts. I take the time to invest in our present and future financial interests. Aren’t you or your family worth this step? You can keep all the important information that you need in your budget binder such as a printable budget sheet, your debts, phone numbers, financial documents etc. Your binder is your financial bible. Don’t let anyone mess with it and keep it private where no one can read through it at their leisure. It’s your personal business that no one needs to know about. You don’t want to be doing your budget in front of the television sitting on the couch. You don’t want to do you budgeting laying on the bed or sitting on the toilet. I know that sounds funny but where you choose to focus on your finances can really make a difference to your overall net worth. If the kitchen table is your only option try to find a small table, desk or cabinet to sit in a corner where you keep all of your budgeting materials. Once you are ready to do your budget you can pull out what you need. Make sure your space is well lit so you aren’t falling asleep next to a dim light trying to run some of the most important numbers of your life. We already know how boring that can be unless your a numbers nerd like my wife. Keeping your budget workstation clean and clutter free will help keep your mind the same. Less is better which means getting rid of distractions that will take your mind away from your budget. If you have kids or other priorities that you must take care of do this first until you have quiet time to focus on your budget. You’ll get more done and likely make less errors. When you want to do it right, do it right from the start especially if you find your debt getting ahead of your finances. The last thing you want to do a sloppy job budgeting your money because you are being too lazy or come up with a million excuses why you can’t get it done. An exceptional month in terms of Income, however I did not earn all this in one go. There is quite a hefty Income Tax return cheque from the government in there. It’s still money I earned over the course of last year that got paid back to me, so it’s still counted as income. Some people will take an income tax return and blow the money on something like a hot tub or something similar. Not me. All of the money and more on top will be going towards my RRSP to take advantage for next years tax return and pretty much take me to the point of fully caught up. Is it worth saving for a rainy day? Sure it is, why would you risk losing everything for the sake of not saving for the future? A day will come when I’m no longer able to work or able to maintain the house or the car myself so paying out more money will eventually hit us. Taking out a loan for a new roof when I’m 65 and then paying it back from pension payments is something I’m not prepared to do. If we look after our finances now, they should look after us when we really need them. Do you know where your money goes every month? I often have fans ask me how to budget money on a low-income or they simply have a high debt load and want to kill it like my friend Tony who got rid of over $100,000 worth of debt by using a budget. We are both money managers of our finances and with our relationship compatibility we have been able to get to where we are in 2016, debt free. I’m not a financial planner/advisor so I can’t tell you how you should budget but I can show you how we budget. I’m just a regular guy just like everyone else; some might call me a budget or numbers nerd. If you have any questions about what we do with our budget money tracker feel free to email me. Our savings of 64.47% includes savings and investments and emergency savings for this month. 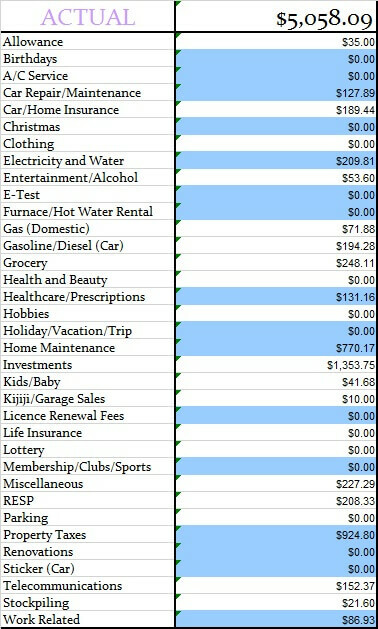 If you include the projected expenses savings, we actually saved 76.59% of our income. That’s $12119.91 going into savings or investments of some description or another. The other categories were well within the defined percentage limits. Our projected expenses this month is at 12.12%. Although I encourage your comments and love to hear what you have to say about our budget categories and expenses please don’t tell us to donate our money to charities because we have too much or are fortunate. We are hardly out of the clear with finances for the rest of our lives and have worked and sacrificed to get where we are. We do plan to enjoy the money we’ve saved now since we haven’t over the years with our son. Almost 8 years ago I started working in Canada making a bit over minimum wage and have since moved up the ladder. I’m now working very hard to secure my dream job with one foot in the door. We aren’t all lucky but if you do the best you can at least you can look back and say you gave it a shot. Saving for stuff you haven’t yet paid for but need to! For now we will have to manually track which means month after month we add up what we save in each projected expense category and minus what we spend so we know how much we have and what is left in each category. I have updated our personal excel budget spreadsheet for 2016. 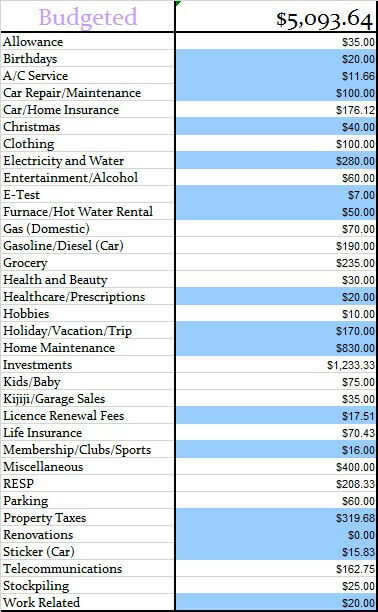 So the $1917.68 gets paid into the projected expense account every month no matter what. It seems to be easier to track our money this way but you can do what works best for you. If our clothing category was a projected expense we would have a budget of $50 per month for the two of us. If we spend $30 on clothes for the month that means we need to pull $30 from the projected expenses account to pay for this expense or we move only $20 to projected expenses for the month and leave the $30 in your chequing account. It’s up to you how you do it as I mentioned above. My plan is to create a projected expenses spreadsheet to track the expenses all year-long otherwise you need to do it manually which we currently do in order to make sure we don’t overspend what we haven’t saved or will save over the course of the year. Time for the juicy category numbers and to see how we made out with our monthly budget. Below you will see two tables, one is our monthly budget and the other is our actual budget for the month of April 2016. This budget represents 2 adults and a toddler plus our investments. Here are my May 2016 goals along with whether I completed tasks from April 2016. Call around to lawyers to talk about getting a Will written up- Pass but will wait to set up appointment once I have a couple of months off from my second job. Buy a new blind for the garage- Fail but we’re looking mostly at second-hand shops. We’d rather not buy a new one if we don’t have to since it’s just going to get mucky. Finish the walls in the baby room- We will likely take down what we put up for our son and change it to a toddler room with cars. Currently it’s a jungle and he’s never slept in a crib yet. What a waste of time that was! Write down what we want in our new kitchen- We talked about wall ovens and counters other than granite. Buy a pressure washer- Fail but I’m looking and waiting for the one I want to go on sale. Sort through our sons clothes and sell some- We sold $0 worth in April but we did give away lots of free stuff to other parents. Start researching vacation spots for 2016- We are talking about going to the Canary Islands or possibly Paris, Spain and Italy after visiting the UK. Hang paintings and wrought iron decor on the walls- Fail but the wife has hinted at it. Swap over winter tires and get a vehicle shampoo and cleaning- I did the tires this week but have not had the inside of the vehicle cleaned yet. In case you missed our budget updates and want to do a quick search I’ve compiled them all on one handy page: monthly budgets. 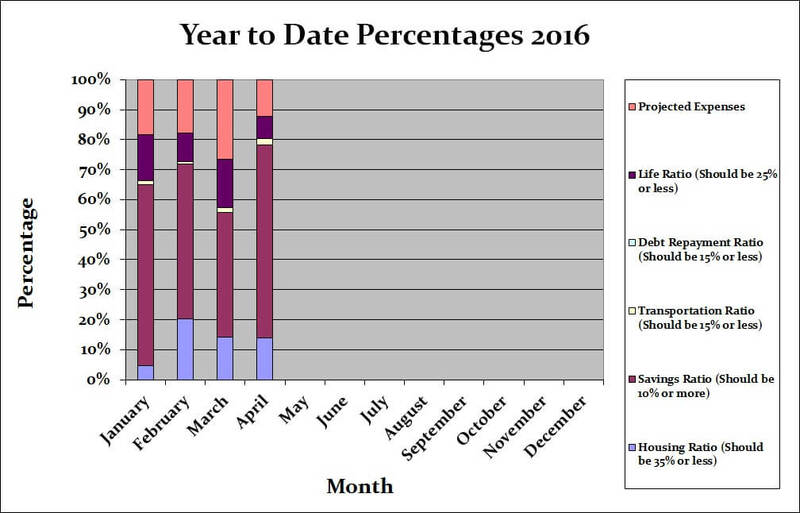 For the 2016 Year I will also keep track of each month below and update the monthly budgets page. 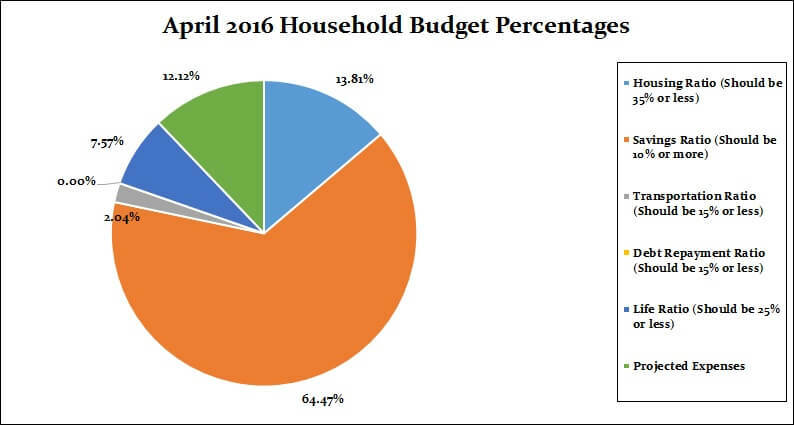 That’s all for this month check back at the beginning of May 2016 to see how we made out with our April 2016 budget. We should learn how to budget. A full understanding of the budget planning and preparation system is essential. Thank you for sharing this.